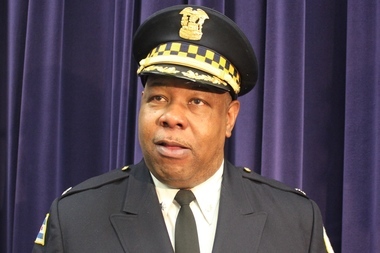 Eric Washington, a 28-year veteran of the Chicago Police Department, was chosen as the new Deputy Chief of Community Policing Friday. CHICAGO — Hundreds of officers and family members gathered at the Chicago Police Headquarters to witness the promotion of four deputy chiefs, five captains and a commander to new roles — including a new deputy chief in charge of community policing. “I congratulate these outstanding members of the Chicago Police on their well-deserved promotions. I look forward to watching them work in their roles to help keep every resident safe and continue building trust between the CPD and the communities they serve,” said Mayor Rahm Emanuel at the ceremony held Friday at 3510 S. Michigan Ave. in Bronzeville. Fred Waller, of the 6th District; Steve Caluris, of the Office of Crime Control Strategies; and Jonathan Lewin, of Technology and Records, were all promoted to deputy chief positions. Fabian Saldana, of the 3rd District; Mark Harmon, of the 8th District; Robert Lajewski, of the 25th District; Paul Kusinski, of the 15th District; and Daniel O’Shea, of the Inspection Unit, were promoted to captain. Dwayne Betts was promoted to commander. Emanuel and Supt. Garry McCarthy tapped Eric Washington, a 28-year veteran of the force, to become the first Deputy Chief of Community Police. The role "will further cement the expanded role community policing and neighborhood partnerships have taken," Emanuel said. “Revitalizing community policing is the foundation of our public safety strategy. Working together to engage with residents in our communities, we will build on the progress we are making toward giving every child in every neighborhood the safety and security they deserve," Emanuel said. Washington, the former commander of the 11th District, will work in conjunction with the patrol division and CAPS personnel to coordinate the multiple community policing efforts and initiatives. Those initiatives, which have been rolled out in the last three years, include moving hundreds of officers out of administrative roles and into foot and bike patrols in hopes of increasing interaction with residents, police said. “This role connects many of our existing efforts to foster stronger relationships with community leaders and residents as we continue working together to ensure the safety of our city," McCarthy said. “CAPS and community policing aren’t just initiatives, it’s how we all work." Washington has served as the Commander of the Narcotics Division and also was the commander of the 11th District. In his 28-year career, he's accumulated nearly 60 awards, including being recently recognized for "extraordinary community partnerships to reduce youth violence" from the MetLife Foundation, police said. Washington said the role is about "making sure we have the connection with the community in the city of Chicago and enforcing that connection." The connection has been there, he said "but it's been a little stagnant." "One of the things I've said time and time again when I was in the 11th District is that the ones that are going to help make the biggest impact are the community. The police department is such a small part of the city of Chicago. It's the residents. They have the power. They're the ones that can control what's going on in their community and we have to work with them, and I want to make sure we're doing that," he said. Washington said he'll begin his new role by talking to district commanders to get a feel for what's working and what's not in the communities. He'll then reach out to community leaders to help the community feel protected instead of "occupied" by police, he said. "We want to make sure that everybody knows it's not an occupation and we're working hand in hand," Washington said. It's also important to eliminate the perception of police arrogance caused by situations such as when officers blasted "Sweet Home Alabama" during a Black Lives Matter protest in December, he said. While some said the officers involved were showing support for the University of Alabama, which was playing in the SEC championship, others viewed the action as racially insensitive. Washington contended the situation wasn't motivated by race but recognized it as a teaching point that officers need to be more sensitive to the community they are policing, he said. "They weren't thinking. They were into the whole Alabama championship and everything else. But we have to get passed that and we've got to impress upon the officers that you gotta think when you're do something you may be doing something that is totally innocent but you gotta also look beyond what you're doing and understand what the overall perception is," Washington said. "It's a team concept that has to be the key concept. It has to carry on from there. It has to be the community and the police together," said the father of two, admitting another obstacle will be uniting the youth and police so they can work together. "There are a number of kids out here doing great things. I have a 19-year-old and 15-year-old and I see what they're doing and see what their friends are doing and we have to bring them in as a part of the whole process and work to make the city and even greater city then it is."